We're in high spirits this week and that means using headlines with the word "Yippee!" in them. "Yippee!" says Matt Swider, reporting the news that Microsoft's Surface has cracked the tablet top five. "Microsoft is in it. In it to Win8," he puns, painfully: analysts at IDC reckon that Microsoft moved some 900,000 tablets in the first quarter of the year, many of them the Surface Pro. Amazon's still miles ahead - and Samsung and Apple are miles ahead of Amazon - but it's good news for Microsoft as it prepares to show of - yes! 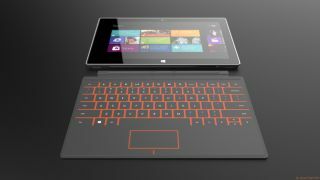 - the Surface 2, which we might see next month. Yippee! Again! Do you know what would be funny? If Apple copied Microsoft, maybe by putting Windows 8's famously divisive Modern/Metro interface into iOS. And do you know what? That's exactly what Apple's doing, and by "exactly" we mean "not really". Apple's iOS is under the new management of design boss Sir Jony Ive, and he is apparently overseeing a significant redesign. As Michelle Fitzsimmons reports, that redesign is going to be "flat". Not just "flat" but "very, very flat," apparently, "sans gloss, shine and skeuomorphism." It has a level of "flatness", apparently, and the learning curve for users also looks "flat". In a word? "Flat". The response to Google Glass has been curiously flat too: the would-be world-changing device may be the most interesting thing in tech right now, but early reviews suggest that if you'd paid $1,500 for it, you'd be a bit disappointed. Our Google Glass review round-up found consensus among the early Glass Explorers: battery life is closer to five hours than the full day Google promised, the screen's hard to see in bright sunshine - something that UK users will have to worry about for, ooh, minutes per year - and the basic features are still, well, basic. Factor in some confusion, frantic head movements and the design of Glass itself and you're going to look and feel a bit daft using it, but it's a fascinating bit of kit with enormous potential. The big problem with Glass isn't the tech, which is great, our columnist Gary Marshall suggests: it's how we'll feel about it. There's a big difference between everyone walking around with cameraphones and actually walking around with a camera strapped to your head - especially when other people can't tell whether you're filming them or not. "Whenever someone comes up with a new technology, someone else finds a reason to panic," he says. "The Daily Mail has already pondered whether Glass could cause cancer, but Glass [also] promises to roll every tech scare story ever into one faintly stupid-looking device". There are two causes for concern: the screen and the camera. The first could make drivers even more dangerous, and the second could make us all paranoid. "Imagine you're in a playpark with your child and you see a funny-looking man wearing Glass, looking over," Marshall says. "Would you feel comfortable? People's fears might not all be reasonable, and they might not last forever, but that doesn't mean they aren't real or that they won't be picked up on and blown out of proportion by the tabloids." We know what you're thinking: which is best? Google Glass or iWatch? And the answer, despite nobody knowing anything about iWatch or whether it even exists, is of course - iWatch. Just ask Jack Dorsey, who co-founded Twitter: speaking to a newspaper in a grilled cheese shop, he said he couldn't imagine his mum wearing Google Glass - and that, of course, means Apple wins. Never mind spec sheets, reviews or star ratings: from now on we're going to judge all tech by whether we can imagine Jack Dorsey's mum using it. We've saved the best news until last: have you been lusting after our digital magazine Tech. but found yourself unable to experience its many joys because you don't have an iPad? Good news! It's on absolutely blimmin' everything now! If that doesn't deserve a yippee, nothing does.